We have the services and expertise to set your mind at ease. If you are concerned about radon gas in your Prince George home or business, Northern Capital Radon Services Ltd., a division of Northern Capital Wood Products Ltd., is here to help. According to the Canadian Lung Association, “Radon is the second leading cause of LUNG CANCER in Canada”. Uranium decays quickly and gives off radon gas with tiny radioactive particles. When inhaled, these radioactive particles can damage the cells that line the lung. Long-term exposure to higher levels of radon puts you at a higher risk for lung cancer. Smokers are even at a higher risk. By simply testing radon levels in your home or work you can identify whether or not you, family members, or colleagues are being exposed to dangerous levels of radon. Once identified proper precautions can be put in place to ensure you and those you care about are living and working in a safe and healthy environment. Northern Capital Radon Services is certified by the Canadian-National Radon Proficiency Program (C-NRPP) as a radon measurement and mitigation professional and is also a member of the Canadian Association of Radon Scientists and Technologists (CARST). Radon is a radioactive gas that is part of our environment. As the naturally-occurring uranium in the soil breaks down, it releases radon gas. Outdoors, radon dissipates harmlessly, however it can collect in low, enclosed places in the ground, like your basement, where it seeps through undetected. Every home in Canada has some radon, but concentrations vary from one house to another, even if they are next door to each other. You can’t see, smell, or taste radon so you and your family can be exposed to radon without knowing it. However, you can protect yourself and your family from radon by measuring the radon level in your home, and taking action to reduce it, if necessary. 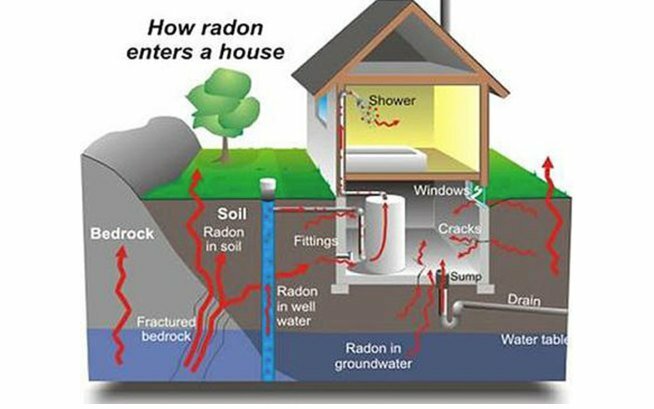 Radon detectors can measure the level in your home. Buy a do-it-yourself kit at our Northern Capital location or give us a call to set up an appointment with our measurement professional. He will do a short-term reading to see if there is an immediate concern as well as do a long-term test for a minimum of three months. The cost to have a certified professional come to your home or business would be $150.00. Modern building practices have created homes and buildings with significantly better energy efficiency over the last few decades. The improvement in insulation and weather tight construction has reduced the air exchange rates in your home or workplace. As a result, this has increased the health effects of building materials, mold, and other contaminants. The buildup of high radon levels has also become a prime concern. By using the specialized radon testing devices, we would be able to locate areas radon is getting into the home, such as cracks, windows, and sump holes, and then seal the entry points. After sealing off entry points it would be important to increase ventilation in your home. We would install the most common and effective method of active sub-slab depressurization since this is typically performed by a certified radon mitigation specialist. Northern Capital Radon Services Ltd. has certified professionals that can come in and do the mitigation if required. Once the steps to reduce the radon level in your home have been taken, we would do a follow-up test to ensure the mitigation worked and the level in your home is below the Canadian Guideline of 200 becquerels per cubic metre. Pricing to perform a mitigation would depend on the type of mitigation that would need to be done. This is a radon reduction system where the underfloor of the concrete pad is placed under a negative pressure by operation of a radon fan. The radon-laden air is removed and exhausted to the outside via a plenum created by gravel and in some cases a series of pipes placed underneath the concrete floor. Similar to the sub-slab depressurization method this radon reduction system exhausts radon-laden air from the foundation weeping tile system via the sump pit. The air is exhausted to the exterior of the building. The sealing method involves sealing of all openings and penetrations through a concrete slab and walls. This would include all floor cracks, perimeter cracks, cracks around floor drains and any other penetration that would allow a gas to flow. The sealing method may act only as a temporary fix or assist in the Sub-slab Depressurization System. Before considering sealing as the only radon reduction method, you should look at all your alternatives. You can, however, seal off large openings around sumps and utility pipes protruding through the concrete. It is possible that these fixes may sufficiently lower radon levels. We realize that for many readers, this is a lot of new information regarding radon and its possible effects. Fortunately, Mike Holmes, best known for his renovation and improvement TV program “Holmes on Homes”, has put together a helpful video that present important information about radon in a straightforward and easy-to-understand manner. If you wish to learn more about radon, its potential effects, and what you can do to protect your family and your home, we have presented a few links that we hope you will find helpful and informative. Northern Capital Radon Services Ltd. Contact us today with any concerns or questions you may have about radon gas.